Every EDC is different. Some use a minimalist approach, containing only a phone, wallet and keys. Others are far more elaborate, uncluding handguns, tools, unique little items and such. Some even gollow a common design theme, be it color, material or brand. 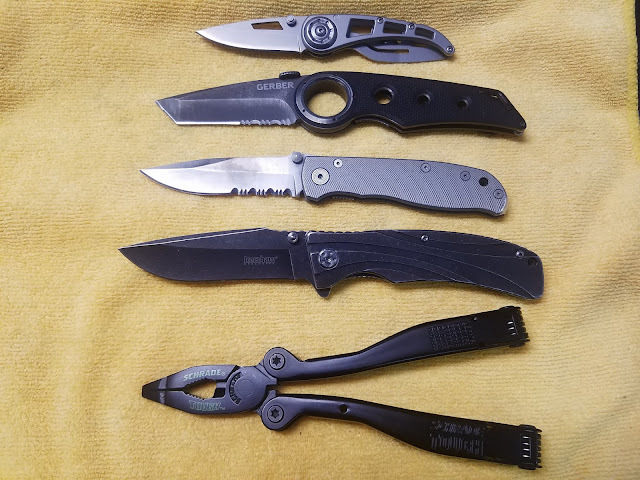 At the top is one of my newest knives, the Gerber Ripstop 1. It's a small frame-lock knife with a very sharp little blade. It's fairly lightweight, due to its small size. Next is my Gerber Remix Tactical folding Tanto blade. This knife, like the rest in this post, uses a frame-lock. The large hole in the center of the hinge makes for a but more control when your finger goes through it. It's also very convenient to hang on a backpack or a peg on the wall. Next is the oldest and most well-used knife in this post, my Gerber Air Ranger. This knife is surprisingly lightweight. My only complaint is that the serration on the blade is too long. Not enough sharp surface. The next one, and the only spring-assist knife I have ever had, is the Kershaw Manifold. It is quite a heavy knife, but it has held it's edge and finish well. The finish resembles the blueing finish you see on rifles. Finally, my other new addition, the Schrade Tough Tool. 10 folding tools plus pliers and wire cutters make this a handy tool to have on you. Might be a little heavy and bulky to go in your pocket, though. Keep checking back for more Gear and EDC posts!